Lots of quick sketches on a rainy Friday night. Stained glass-inspired angels. Recent Museum-trip inspired dinosaurs. In July we paid a quick visit to Melbourne Museum to wander through the dinosaur exhibit. I think my 12-year-old self came to life. I find dinosaurs incredibly intriguing animals and great drawing subjects. But sometimes life works out in such a way that the country bumpkin born-and-raised geek girl doesn’t get to experience city luxuries – like museums. So finally getting to spend some deliberate time in the dinosaur exhibit was long overdue. One thing I hadn’t quite appreciated is just how large the hadrosaurs were. I know that there are usually helpful silhouetted man next to reconstructed fossil diagrams in dinosaur books, but nothing compares to really beholding in real life the sheer size of what must have been amazing animals. Sorry, that was a long sentence. This is a really, really rough sketch, inspired by an illustration of Edmontosaurus. 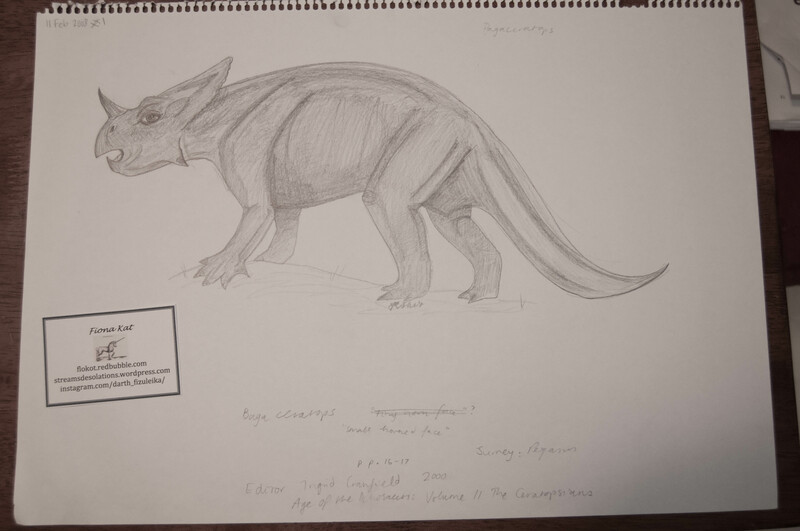 Posted in animals, art, religion and tagged angel, art, dinosaur, drawing, graphite, museum, palaeontology, pencil, religious art, sketchbook on July 25, 2015 by Fiona.